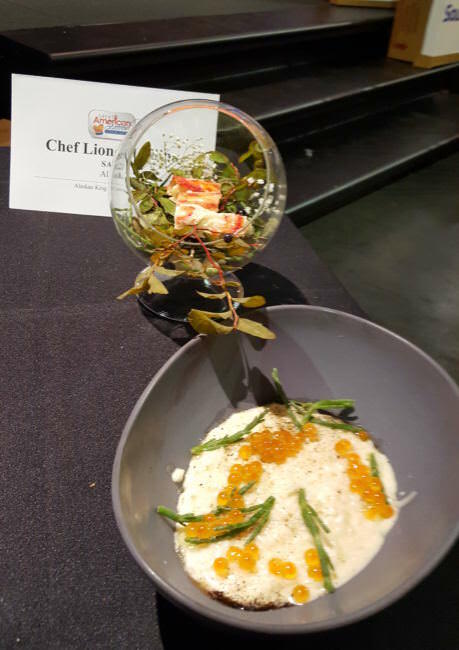 This month Juneau chefs Lionel Udippa and Jacob Pickard represented Alaska at the Great American Seafood Cook-Off in New Orleans. In a hotel room in New Orleans ahead of the cook-off, the two chefs were sweating. The rice is a key ingredient in one of Uddipa’s contest risotto. 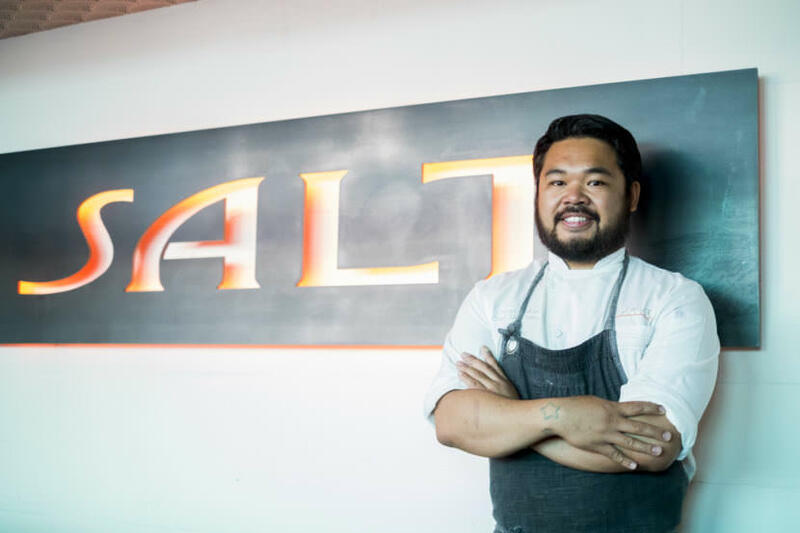 He calls it a lifestyle dish, a comfort food combining aspects from both sous chef Jacob Pickard’s Italian heritage, and his own Filipino roots. Together the chefs went through a dozen variations before settling on a plate that represented the seasonality of Alaska’s fisheries: alder smoked Bristol Bay king crab, skewered with a blueberry branches from Eaglecrest, and the risotto garnished with sea asparagus foraged with their toddlers. In their hotel room the chefs stayed up until 2:30 in the morning workshopping their dishes — tweaking the vanilla ratio, counting out salmon roe — and practicing their presentation. In front of television cameras and a live audience the following day, they had only 60 minutes to prepare seven plates. Timing was key as they skewered the crab thighs, smoked the alder wood and made final counts of sea asparagus and salmon roe. At first, Uddipa’s rice didn’t cook fast enough. “Five minutes felt like 30 seconds,” Uddipa recalled, knowing if risotto sits out too long, it gets mushy. 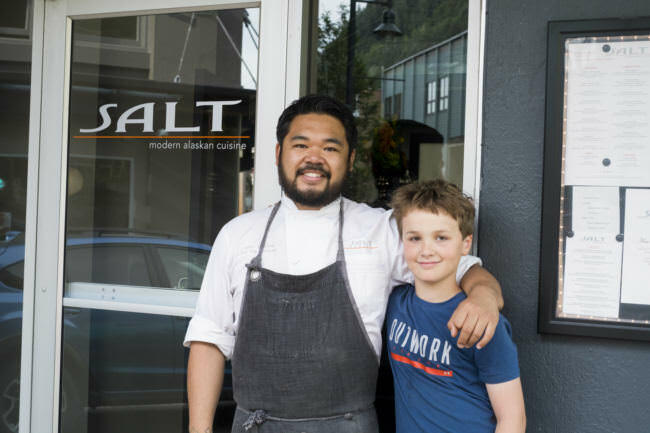 Back in Juneau outside the restaurant Salt, Uddipa runs into another Juneau-famous chef: 10-year-old Denali Schijvens, who cooked his way to the White House and competed on Food Network’s Chopped Junior. The pair have been cooking together since Denali was 8, he considers Uddipa his mentor. Like Denali, Uddipa grew up around food, helping out his aunt who owned Valley Restaurant. His cousins and siblings would play in the apartment building upstairs. Uddipa’s advice for aspiring chefs like Denali? “Be humble, and just be willing to learn, always try to improve from yesterday,” Uddipa said. Uddipa said he still polishes silverware, helping out wherever he’s needed at Salt. 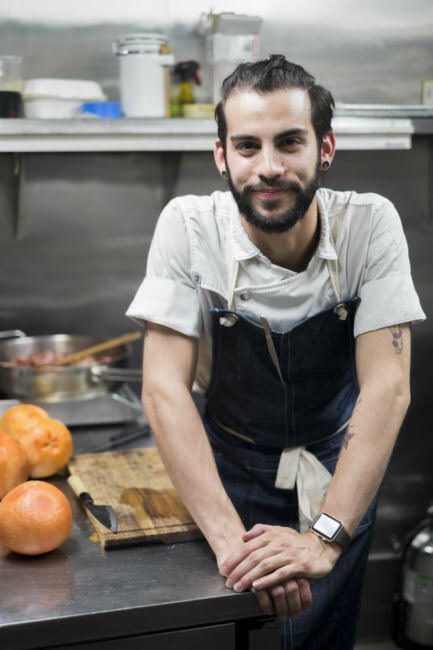 His teamwork with Pickard and creative spirit continues in Salt’s hot and humid kitchen. Bacon lardon sizzles as Pickard slices grapefruit. It’s for tonight’s scallop special. “It’s going to be a salad made out of shaved Brussel sprouts and zucchini with a grapefruit vinaigrette and champagne with whipped mascarpone and honey,” Pickard said. They’ve only been cooking together for eight months. Long before the contest, Pickard started making their winning risotto’s signature ingredient, a black cod fish sauce stored in a downstairs prep kitchen. Uddipa recommends plugging your nose. But in very modest dabs in risotto, Pickard said the fish sauce adds another level of salty, oceany umami. The winning dish will be on Salt’s menu of specials soon. The Alaska Seafood Market Institute sponsored the chefs’ trip to the New Orleans and provided coaching support. Juneau chef Beau Schooler won the same national competition in 2015.